I’d been to Nashville when I was a kid, but we all know those visits don’t count—it’s different seeing a place for yourself. So, when my colleague Seth and I drove down from Washington, DC, in the fall of 2013, I wasn’t sure what to expect. I was new to IJM and new to Nashville. 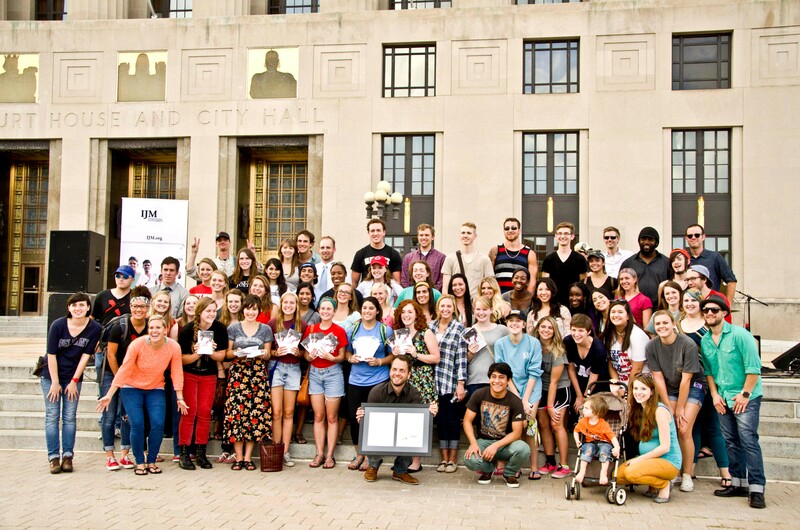 WE WERE MAKING THE TRIP BECAUSE—through a series of fortunate events—the city of Nashville had proclaimed October 1, 2013, to be IJM Day. At the time, our focus was on raising support for a bill that would give the Trafficking in Persons Office (the nerve center of the U.S. government’s anti-trafficking and anti-slavery activities around the world) the access to the decision-making table it needed. Seth and I planned to use the day to hold a rally on the Nashville City Hall steps. Student volunteers from local universities and a musician partner came out to show Tennessee’s Congressional delegation how much their constituents cared about ending modern-day slavery and stopping human trafficking. We weren’t a big crowd, but we were a passionate crowd. This is taking me back! Here’s a photo from the rally in 2013. You can read my blog about the event here. I was struck by how willing the people there were to give of their time, because the issue of modern-day slavery is one that can seem distant and hard to grasp. But for the people standing beside me in the sunshine on that day, modern-day slavery wasn’t far away at all; they had taken the cause of the oppressed deep into their hearts, and they were determined to do what they could do. And that day, what they could do was come to a rally on the steps of City Hall and ask their elected officials to use their power to help end slavery. So they came. YOU’VE PROBABLY HEARD OF THE CONCEPT that something as small as a flutter of a butterfly’s wing can ultimately cause a typhoon on the other side of the world. I’ll leave it to the physicists and philosophers to dice out chaos theory, but what I’m getting at is how true it is that the small actions are what make the great movements happen. I’ve seen the fruits of faithfulness time and again while I’ve been at IJM. I’ve seen how all those petitions signed, those postcards to members of Congress, those lobby meetings, and all the rest are the building blocks of the bridge to freedom for those who are living in the darkness that is slavery. Our actions can seem so small and insignificant, but now, whenever that lie gets me down, I remember Nashville. MUSIC IS AS EMBEDDED IN THE CITY’S SOUL as the river that runs through its center. Nashville is a city of voices. Some of those voices have defined entire genres of music, echoing over the airwaves and over ripples of time to move the hearts and heels of millions. So in a way, it’s not surprising that the voices of those advocates on the steps of City Hall made their own impact. Senator Corker of Tennessee does not do half-way. From the age of 13, when he was bagging ice and collecting trash, to the present day, as the chairman of the Senate Foreign Relations Committee, he has shown himself to be a man of drive, intention, and purpose. When he found out about the issue of modern-day slavery and saw how much the people he represents care about ending it, he saw that it was time for a sea-change. Almost exactly a year ago, on February 24, 2015, Senator Corker introduced the End Modern Slavery Initiative, a bill that—if enacted—will be the sledgehammer knocking down the walls in the fight against slavery. The problem of modern slavery is one of the most urgent in the world today. We know how to end slavery, but we need to take those methods we know to be successful to the next level so that freedom is that much nearer and comes that much more quickly to the millions living in slavery today. And that’s what the End Modern Slavery Initiative will do: take the fight to end slavery to the next level. EARLIER THIS WEEK, Seth and I were again on the road to Nashville. This time, we and IJM volunteers were attending a rally being held by Senator Corker and the End It Movement, in support of the End Modern Slavery Initiative. It’s incredible to see how the little group on the steps of City Hall have contributed to this momentum. It’s incredible to see how a few voices, a few acts done in faithful devotion to the cause of freedom, lead to the involvement of a person of power and influence, and a bill that could change the story of slavery into the story of freedom. There is road that lies in front of us yet: making the End Modern Slavery Initiative into law is the next major milestone. It’ll take all of us to do it, and I hope you’ll join me in doing what you can do to get it passed. But next time you wonder whether it matters if you sign a petition, call—or tweet!—your member of Congress, or attend a lobby day, remember those butterfly wings, and remember Nashville, city of voices. As promised, here are some amazing Nashville spots that you cannot miss if you like eating and fun. If you’re not into either of those things, skip this section (and Nashville). First things first! Come for the coffee and stay for the breakfast. If there’s a way to start the day, I think this café knows what it is. The java is perfectly percolated and the bagels are fresh. With lots of big windows, wooden furniture, and a bustling street outside, Fido is a nice place to perch with your paws wrapped around a cup of joe and see the scene. I’d call this super cool venue The Freedom Commons, in social club format. What does that mean? Well, The Freedom Commons is where you are right now: it’s our online hub where advocates can gather, take action, and end slavery. Pinewood Social is a place to gather (really good space), take action (there is a bowling alley, I’m not kidding), and … energize yourself to continue the fight to end slavery? Enough of this shameless plug for The Freedom Commons (but not before I tell you to sign up for an account if you haven’t already! )—Pinewood Social is the social club of these our modern times. It is swanky without being pretentious, lively without being loud, and relaxing but busy. Chill, nibble, sip, bowl … you’re guaranteed to enjoy your time at this Nashville joint. Bonus? There’s a great view of the river and the city right outside. Our server told us the burger was life-changing, and I thought, “Right. They all say that.” But I shouldn’t have had sarcastic thoughts, because he WAS right. It was delicious. “If it doesn’t come from the South, it’s not coming through the door,” says their chef. According to their website, it’s all about discovering the reality of Southern food, and they’re into seed-saving, heirloom husbandry, and in-house pickling—I’m stopping there. You should just go and eat for yourself. Diet schmiet. The only reason you should not get yourself on the fast bus to Jeni’s is if you are lactose intolerant—and even then, they might have some sorbet. This is where the world’s most spectacular ice cream flavors come together to create a delightful creamery experience for all who may enter the parlor doors. Jeni’s is proof that we do have secret separate desert stomachs, because I ate at Husk and still found that I could manage a scoop (or two). No excuses: get thee in line for some cool goodness. Welcome to a city of voices.